This time it’s set between Malta and Scotland, with a rich cast of historical characters and another rollercoaster ride through a turbulent political era. 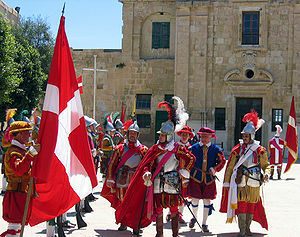 I knew very little about Malta or the Knights Hospitaller before I started, and quite a lot more by the end. I’m not sure that I enjoyed it as much as the first two – there are an awful lot of battles and I’ve always been one to skip battle scenes. There was also mention of various practices I thought it was probably better not to look up as they were considered barbaric even at that time, and very dubious sexual politics. It was more interesting on a human level though, with a few glimpses of Lymond’s real character and what makes him tick. I’m developing a real fondness for Philippa Somerville too. So what’s it about? Having travelled to Malta as a mercenary for the Knights of St John in their battle against the Turks, we see Lymond in full flow, both as a warrior and at his most irritatingly light and cynical in the company of all these warrior monks. After their inevitable defeat, he returns home to Scotland with the aim of setting up his own mercenary company. It will be the best, bring him fame and fortune, and peace to Scotland and the borders. Or at least that’s the plan. I was highly annoyed by the massive spoiler on the back cover of the copy I read so I won’t say too much here about the villain of the piece, but very nasty he is too. 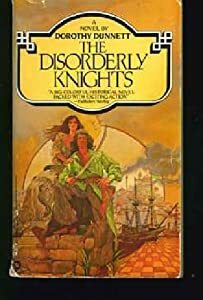 This entry was posted in Books, Reading, Reviews and tagged classics, Disorderly Knights, Dorothy Dunnett, historical fiction, Knights Hospitaller, Lymond Chronicles, Malta, reading, recent reads, recommendations, reviews, Scotland. Bookmark the permalink. NO! Keep going. The next book is amazing, and your work with this one will pay off. Later, with hindsight, you will appreciate this book. Just crack the Pawn in Frankenscense – it has an excellent opening chapter. Oh, I will keep going, don’t worry! I just have to put it on hold for a while. great review, thanks. but please push on to the next book, and to the end of the series … it will be worth it! and you’ll have bags more historical trivia too, just waiting to be inserted at the right moment at dinner conversations!!! You will love Pawn in Frankincense! Apart from the heartbreaking parts. I adore DD as a writer without peer. I re-read this series often and only struggle with The Ringed Castle, sometimes skipping to the end because of an event that is agonisingly lovely. many people consider Pawn in F the best novel. i know the spoiler to which you refer but given that Lymond makes it plain from first meeting that the character is under suspicion we are not surprised. knowing Lymond better now, we know he is not motivated by threats to his leadership – well, not by jealousy or preciousness. what i found hard in The Disorderly Knights was Francis not sharing his reasons for mistrust but he rarely does. and there is still suspense and some heart racing – when Philippa discloses her secret to that person for instance. you will love Pawn in Frankincense! It’s difficult to know if you will like PiF more or less than DK. It’s a very different book – a quest. There is more Philippa Somerville, though, and a great new character, in Marthe. It’s also the reason why 100+ Dunnett readers recently met up Istanbul to visit Topkapi Palace and various other places there. But whether you read it soon, or delay for a little while, do read it – it’s great. I will read it, promise. just to add to the chorus, PiF is really good and hold the pivotal moment in the saga – not to be missed! I went on the Siege to Istanbul and it was a delightful experience – so wonderful to stand in the same places Dorothy uses to skillfully to tell her special tale……..I also skip parts of Ringed Castle, but Checkmate is the perfect end to a fabulous journey……..carry on!! Thanks for commenting. I’ll look forward to it then.